The U.S. Health Resources and Services Administration (HRSA) has announced two inter-related grant programs that are creating the most significant presence to date for "integrative medicine" at the federal level. The two programs total $3.3 million over the next 3 years. The largest chunk is $2.5 million to dispense to some 16 programs, most likely in grants of up to $150,000 each to conventional medical schools as part of an integrative medicine in residency (IMR). Beneficiaries will offer programs to incorporate "evidence-based integrative medicine" content into existing preventive medicine residencies. The second is more remarkable, by title. With $800,000 to some entity, best bet a medical school, HRSA will establish a National coordinating center for Integrative Medicine (NccIM - their acronym). The core purpose is to provide technical assistance to the IMR programs, and to evaluate them. The Center's initial duration would be September 2012-September 2014. Comment: The creation of NccIM is interesting for those who recall the recommendation of the White House Commission on CAM Policy (2001) to create a federal CAM center. The National Policy Dialogue to Advance Integrated Health Care made a similar recommendation. Nothing faintly echoing this has happened for the ensuing decade until this HRSA program. The question is: Is NccIM only meant to oversee the IMR? The language in the grant suggests a longer reach. The scope of technical assistance to be provided is explicitly "not limited to" the IMR programs. In fact, the NccIM will be charged with "analyzing the efficiency of integrative medicine." This would seem to open a barn door into untold opportunities. For instance, the NccIM can assist not only grantees but "other interested residency programs." No limit to preventive medicine here. In addition, the NccIM will offer "guidance in the implementation of the integrative medicine projects, and demonstrating expertise in the field of evidence-based integrative medicine modalities for health professions disciplines." "I have been happy dancing and exchanging emails and texts with colleagues for the last two hours. "This is great news for the American people and for the integrated healthcare community. First of all it says that this country and all of its three branches of power are not hopelessly lost in a partisan fever that outshouts all rational thought. That is good. Secondly, by upholding the individual mandate the laws financial 'success' is much more likely and thus the vision is given a chance at sustainability. It is as near as we have ever been to making a clear statement that people have a right to health care, although those are not the terms on which this was argued or decided. "Perhaps the best news, however, is that a law that is designed to move us from thinking about medical interventions to thinking about health promotion and maintenance is allowed to move forward. This law has within it some sections that are distinctly supportive of bringing integrative healthcare professionals into public health and healthcare delivery systems. More than that, however, it is chock full of language that speaks the values of most CAM professionals - values of primary prevention through helping people establish and maintain good health and balance - a worldview that acknowledges that health and/or disease is established by how we live, including how we are able to live in a country full of economic and geographic disparities. "This understanding is acknowledged in the creation of the National Prevention, Health Promotion and Public Health Council which charges 17 distinct cabinet level departments and agencies with joint responsibility for wellness and health promotion because distinct as they might be, what they each do contributes to making it easier or harder for Americans to live healthy lives. It is a victory that this has been acknowledged and acted upon. Last week the Council released its Action Plan which takes the National Prevention Strategy and moves it into specific actions that each department/agency is taking or is committed to taking in the coming year. It is not everything we might have dreamt of, but it is a good start. It is my sincere hope that this ruling by the Supreme Court further protects the Prevention Fund and these efforts as well." Comment: It is not everything we have dreamt of, but it is a good start. I share this sentiment, and it is also clear that a significant subset of the integrative practice community finds the Affordable Care Act a dangerous abomination. One long-time reader, the community-based integrative medical doctor Chris Foley, MD wrote of my support: "You have no idea how much this will cost, the potential gain sharing, the total waiver in it of all the Stark and Waxman laws (surprised? ), and the massive bureaucracy it will create. Your ardent support without really understanding even fractions of the bill or how an ACA will be run is embarrassing." Holistic Primary Care editor Erik Goldman offers his wide-lens, ironic perspective here. Another valuable perspective that dissents from support of the reform is that of the Alliance for Natural Health. Their perspective focuses on Health Savings Accounts: What the Supreme Court Decision Means for Integrative Medicine. A view from functional/integrative medicine leader and author Mark Hyman, MD is here: Why Obama Care is Not Enough: It's the Costs, Stupid! In a note in the newsletter of the Consortium of Academic Health Centers for Integrative Medicine (CAHCIM), Mayo Clinic integrative medicine leader Brent Bauer, MD posted this notice: "The Division of General Internal Medicine at Mayo Clinic is actively recruiting several internists to join the practice. While these positions are not specifically dedicated to individuals with integrative medicine training, the Division leadership has encouraged us to seek colleagues with such skills and encourage them to apply. If you know of highly qualified general internists - with skills in integrative medicine research, education and/or practice - who would like to explore what a blended career of general internal medicine and integrative medicine at Mayo Clinic might be like, please have them contact me." Comment: This is a remarkable, quiet sign of the inroads of integrative medicine. In a system as respected in conventional medicine as Mayo, the "Division leadership has encouraged us to seek colleagues with [integrative medicine] skills and encourage them to apply." Some sad-sack non IM applicant is going to end up going home to his/her spouse and say: "Can you believe it? I got beat out at Mayo by some jerk who'd studied that integrative medicine crap!" The title of the Acupuncture Today article is "Who Does Best in Hospital Practices." Author Christian Nix quotes one hospital-experience provider: "If you even say the word qi within earshot of hospital physicians, you're finished. Mention ‘yin and yang' and you're classified as a stoner and surfer who had time to kill and so decided to take up acupuncture." The column provides the service of beginning to share the distinct skill sets needed of licensed acupuncturists who wish to work in hospitals and other integrated settings. Comment: Nix apparently offers a training program. His views appear to be quite consonant with those expressed by a multidisciplinary group, the Academic Consortium for Complementary and Alternative Health Care with which I am involved via their Competencies for Optimal Practice in Integrated Environments. The Center for Integrative Oncology and Survivorship at the Greenville (North Carolina) Hospital System announced a pioneer partnership with Cancer Support Community (CSC) called "one of the largest worldwide providers of social and emotional support for cancer patients and their caregivers." Two medical directors of the Sutter Downtown Integrative Medicine program in Sacramento, California published a media piece on how the new guidelines of the American Academy of Neurology and the American Headache Society "now endorse the use of several alternative therapies to help keep migraine headaches at bay." The Program in Integrative Medicine in General Internal Medicine is serving as the clearinghouse for the diverse CAM/IM programs at Johns Hopkins University. The Chicago Tribune marched out Brent Bauer, MD, integrative medicine leader at Mayo, to comment on a piece on integrative back pain care. The inaugural Connor Integrative Medicine Network "Heal the Healer Symposium" associated with Case Western was announced. In CAM on America's Main Streets, Sita Ananth, MHA of the Samueli Institute writes in Hospitals and Health Networks about integration in rural hospitals. Duke Integrative medicine is teaching patients how to get quality food in Eating Local 101. The pitch for an "integrative medicine consult" from the Cleveland Clinic is here. Ben Kligler, MD, MPH and his integrative team are the focus of this significant feature in the Albet Einstein College of Medicine. Kligler directs the student wellness program at Einstein. The Windbur Medical Center Institute of Integrative Medicine provided instruction on botanicals to a volunteer group of girl scouts. A physician with Seattle's Virginia Mason Medical Center talked up the toxicity of herbs for the American Liver Foundation. The Abbott Northwestern Hospital's program and Penny George Institute were the subject of this CBS News feature. The Aurora Medical Center's "holistic hub" model, and its new IM directors, were featured here. 1st in "getting timely care, appointments and information"
1st in "how well providers communicate with patients"
2nd on "helpful, courteous staff"
3rd highest of the 46 on "overall rating of the provider." Bastyr was one of just 4 of the primary care clinics surveyed to rank above average on each of the areas surveyed. Naturopathic doctors are considered primary care doctors in Washington state. An introductory section to the report describes why the Puget Sound Alliance of employers, government agencies and health plans believe patient experience is so critical: "Patient care experience is linked to clinical quality." The authors add: “Patient-centeredness is now widely accepted as a core dimension of health care quality. The term may seem like jargon, but it refers to important, basic ideas." These include, according to the PSHA authors: patient self-knowledge, patient self-efficacy, reduced cost of care (less non-value-added or duplicative care), increased adherence to provider recommendations for care and for use of medications, and reduced medical errors and adverse events." Comment: It is fascinating how antagonists to whole person care that includes taking time with people, such as patients experience with the naturopathic physicians at Bastyr's teaching center, will dismiss the positive outcomes as merely a function of time spent with patients. Given the extraordinary number of outcomes that are linked to patient experience, perhaps providing patients something patients clearly like should be honored rather than dismissed. If the values noted above are not sufficient to make this point, the Alliance, by the way, also links positive patient experience to: patient empowerment, better independent decision-making and self-care, reduced medical errors and adverse events; improved clinical outcomes (e.g., blood pressure or cholesterol levels); improved quality of life and well-being; reduced disparities in care; and improved survival. Huge. Credit the Bastyr providers and disciplines. This report is an interesting companion piece to a patient survey from the Canadian College of Naturopathic Medicine reported here. The New York Times "well blogs" piece by Pauline Chen, MD is entitled: Afraid to Speak up at the Doctor's Office. Chen references all the focus on "patient-centered" care and "shared decision making" and concludes: " ... one thing has been missing in nearly all of these earnest efforts to encourage doctors to share the decision-making process. That is, ironically, the patient's perspective." Chen notes a May issue of Health Affairs that included an article entitled: Authoritarian Physicians And Patients’ Fear Of Being Labeled ‘Difficult’ Among Key Obstacles To Shared Decision Making. Chen says the study "uncover(s) some of that perspective (that) ...in our enthusiasm for all things patient-centered, we seem to have, as the saying goes, taken the thought of including patient preferences for the deed." The authors of the Health Affairs piece conclude that "physicians may not be aware of a need to create a safe environment for open communication to facilitate shared decision making." 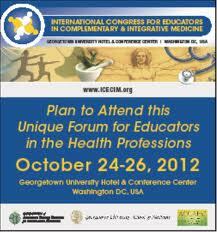 The first International Congress for Educators in Complementary and Integrative Medicine (ICECIM) drew a huge outpouring of proposals and abstracts. In a rush of activity prior to the mid-June closure of submissions, 244 proposals were received. Of these 91 were abstracts with the remainder a mix of such formats as large group panel discussions, symposia and small group discussions. The congress is jointly sponsored by the Consortium of Academic Health Centers for Integrative Medicine, the Academic Consortium for Complementary and Alternative Health Care (ACCAHC) and Georgetown University, the host site. Attendance will be limited to 300. July 31, 2012 is the deadline for early registration. Comment: Because I serve as part of the ACCAHC team on ICECIM's well-integrated planning committee, I was aware of the flow of submissions. A very slow trickle led to a last-minute deluge, suggesting nothing more than that the academics who submitted are all busy people who only get around to things at deadline. As a person who helped stimulate proposals from the ACCAHC communities of educators, I can say that this Congress would be exceptional if all one experienced were the two dozen or so proposals of which I was aware - many of which will not be selected, given the competition. Decisions will be made by July 15. Check out the site after for more program information. This looks to be a terrific Congress whose time has come. Chiropractors and licensed acupuncturists associated with New York Chiropractic College are part of a consortium created by the University of Rochester to successfully be named by the National Institutes of Health as one of 11 new pain centers. A release from NYCC notes that the focus of the $275,000 project will be to "create materials that will be used worldwide to help teach health care professionals - physicians, chiropractors, nurses, pharmacists, dentists, and others - about the latest treatment strategies for patients in pain. The 5 "in-depth studies" of pain will include: a 7-year-old boy who suffered a brain injury during birth and is in severe pain; an 80-year-old woman with back pain; a 66-year-old woman with lung cancer; a 15-year-old girl with jaw pain; and a 34-year-old woman with severe abdominal and pelvic pain. According to the release, the Rochester/NYCC group is one of 11 teams chosen by NIH to form a nationwide coalition of Centers of Excellence in Pain Education. Metrics - addresses HOW one measures whether learner assessment and evaluation of educational impact and care delivery systems influence individual and population health. Comment: The innovations called "team care" and "IPE" (interprofessional education) were the major energizers of this Global Forum. These movements represent a tremendous opportunity for the integrative disciplines to get into the dialogue, and into team practice. This is particularly so since those pushing better teams and IPE closely identify themselves with "patient-centered medicine." The learning here will be useful. At the same time, the gatherings will be remarkable opportunities to mix with the leadership of these national organizations. I'll be present on behalf of ACCAHC. If you are around the Beltway or due for a trip to the Capitol, come participate! The International Research Congress on Integrative Medicine and Health (IRCIMH) drew over 1000 researchers, educators and clinicians from over 30 countries to Portland, Oregon in mid-May 2012. IRCIMH has now made abstracts and various keynotes available here. The interest in the triennial congress, formerly the North American Research Congress for Complementary and Integrative Medicine, and more importantly the vastly expanding production of CAM/IM research, has led the organizers, led by Adi Haramati, PhD, to move the Congress to a biennial schedule. The 2014 meeting will be in Miami, Florida in mid-May, 2014. Comment: I am listening to IRCIMH keynoter Matt Lauer, MD's powerful presentation on comparative effectiveness research while writing this. This is a tremendous meeting and, increasingly, a multidisciplinary community gathering. My guess is that many drawn to this conference would also be drawn to a dance floor if they chose to have a banquet and music on the last night in Miami, 2012. I wonder, however, if more conservative participants would worry that all of the reported findings would be compromised if researchers showed such enthusiasm. Wouldn't a conventional medical reporter necessarily reference the in-august demeanor of the sweating participants? Wouldn't results thereby be tainted? A group of naturopathic physician researchers led by Erica Oberg, ND, MPH and Carlo Calabrese, ND, MPH presented a poster at the May 2013 International Research Congress on Integrative Medicine and Health entitled "Systematic Review of Outcomes Studies of Outcomes Studies of Whole Practice Naturopathic Medicine." While the team acknowledged that "formal whole practice studies in naturopathic medicine are a recent phenomenon," they were able to identify 13 that met the inclusion criterion of having at least two modalities. All of the naturopathic studies were on chronic conditions. "Some degree of clinical benefit" was found in each, "sometimes quite strong." Eight of the 13 used quality of life measures with all showing improvements. While noting many "methodological weaknesses," the team concluded that the review "provides evidence of effectiveness and cost savings in chronic diseases in the observed or validly-modeled practice of trained and licensed naturopathic doctors." Comment: If the so-called "integrative practice" fields never taken on the arts and sciences of evaluating multimodality, integrative practices, these fields will be sentenced to whining about not a misfit of a reductive research paradigm. I credited these naturopathic doctor researchers in a Huffington Post column entitled How Naturopathic Doctors are Proving the Value of Integrative Medicine. As of July 2, 2012, over 630 had re-posted the piece and over 1600 "liked" it and 43 had commented. "Yes, I will be retiring toward the end of the year. It has been a really incredible run here at NIH in a number of often challenging but always fascinating and deeply rewarding jobs I never dreamed of when I started it all 32 years ago! I plan to do some part-time freelance consulting; devote a good bit of time to writing and teaching about the intersections of science, self-awareness, emotional intelligence, and personal growth (a long-standing personal interest); do some volunteer work; and check off items on the bucket list." The announcement is posted here. Applications are due August 13, 2012. Comment: Integrator readers will know my bias in favor of NCCAM be led by individuals with depth involvement in, and understanding of, multimodal, individualized, whole person integrative practice. Neither Killen nor Briggs met the criterion (thus my Oops, They Did it Again column that still haunts a Google search of Josephine Briggs, MD). Notably, applicants for this position once again require no such experience. They seek an MD or PhD with "the ability to communicate with and obtain the cooperation of national and international organizations and individuals who represent wide-ranging disciplines and competing priorities." While he hadn't a background in integrative care, to all the accounts that have reached my ears, Killen has exemplified this latter plays-well-with-others criterion. I am pleased, particularly following some exchanges at the most recent International Research Congress on Integrative Medicine, to have experienced his collegiality. That said, let's hope that the next deputy director is drawn from the growing community of researchers who are already skilled in respecting the real-world complexities, and opportunities, for thinking about and researching whole person integrative health care. The June 2012 Integrator Round-up noted that NIH NCCAM has created a new blog and than an early offering from director Josephine Briggs, MD, is "Integrative - What Is in a Word?" The posting has stimulated a dialogue with over 40 comments. At the center of it is Integrator columnist Taylor Walsh, taking on an outspoken, anti-CAM and anti-NCCAM bashers and trying valiantly to keep a steady hand. Early respondent acupuncturists like Stacy Gomes, EdD weigh in again. Then the anti-CAM heavy-weight David Gorski, MD makes an appearance. Take a look. Weigh-in. Comment: When Walsh wrote to me of the exchange I replied that I always think of the tar baby of Uncle Remus fame (betraying the racist roots of education in the 1950s - but taking nothing from the metaphor) when I think of engaging CAM/NCCAM antagonists. One hand sticks, then the other, then one leg, then the other. Until before you know it your entire being is caught up in a fruitless effort to convince the unconvincable. My Huffington Post articles sometimes draw a similar ilk. However, this dialogue, on this NIH NCCAM site, may be the place to have this conversation. It would be nice if the integrative medical researchers and academics who receive the lions' share of NCCAM largesse would weigh in. It's ironic that the agency is being defended by a consumer-writer (Walsh) and members of a lightly-funded licensed acupuncture and Oriental medicine community rather than those who have been the apples of NCCAM's eye. There is something sort of fairy tale-ish about that. Yes take a look. Then weigh in. When I did, I began my substantive remarks with: "While the term 'integrative' is useful - and I use it a lot - it is potentially a dangerous estrangement from the roots of what her agency was charged to explore: alternative modalities, systems and disciplines ..."
The attorney and adviser to a consortium of integrative physician organizations, Alan Dumoff, JD, MSW, has called the potential inclusion criterion of a new American Board of Integrative Medicine (ABoIM) "angst-inducing." 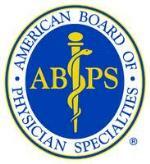 The ABoIM is backed in its move to gain recognition from the American Board of Physician Specialties (ABPS) by the Arizona Center for Integrative Medicine which offers by far the most influential Fellowship in Integrative Medicine in the country. Dumoff's sometimes client, the Integrative Medicine Consortium (IMC), is led by community-based integrative physicians who have not completed fellowships. Instead, they have learned via colleagues and seminars and certificate programs. In a guest column in The Integrator Dumoff writes: "The eligibility criteria to sit for the examination, and inclusiveness of how core competencies are defined, will have a dramatic effect on the future of integrative medical practice. If eligibility is limited to graduates of academic fellowships, the more adventurous physicians who have been able to develop functional medicine to surprisingly complex levels, in part because they have been free of academic medicine, will risk losing the credential for the very field they have been central to creating. For these (integrative physicians) who would be excluded, an ABPS credential could provide well-deserved armor against the scorn of uninformed peers." Notably, the IMC has also queried the ABoIM on allowing naturopathic physicians to sit for certification. Comment: The University of Arizona's move has stimulated a huge outpouring of interest. See Strategic Shift: Weil's Arizona Center Leads Push for MD Board Certification in Integrative Medicine. The backers of the initiative have not shared developments since the announcement. Now have they formally responded to the IMC and others that attempted engagement on key issues, such as grand-fathering, on which Dumoff touches, and interprofessional education. Dumoff's column and some comments are here. The membership of the Coalition for Patients Rights (CPR) received a heads-up note June 20, 2012 regarding a proposed Resolution 241 (A-12) under consideration by the American Medical Association House of Delegates. The proposed resolution requested that the AMA "promptly initiate a specific lobbying effort and grassroots campaign" to repeal the provider nondiscrimination provision of the Affordable Care Act. The note, from nurse anesthetist Maureen Shekleton, PhD, RN, FAAN, a "professional relations specialist" for her profession, continues: "This is not new activity from the AMA and, in fact, the AMA's reference committee that heard the resolution recommended just reaffirming existing AMA policy on this issue, but the HOD asked for a report back at the November 2012 Interim Meeting." The motion was brought forward by the Arizona Delegation of the American Society of Anesthesiologists. A report from the AMA on actions taken at the meeting did not mention the non-discrimination issue. Shekleton anticipates increased AMA activity to prevent the non-discrimination statute from shaping care after 2014. The American Chiropractic Association, American Association of Naturopathic Physicians, American Association for Acupuncture and Oriental Medicine and Integrated Healthcare Policy Consortium are each listed as members of CPR. Comment: The AMA action on this is likely to be as widely advertised as are actions of any groups that engage organized bigotry. Good that the CPR is tracking it. Notably, the state backing this action, Arizona, is known, lately, for promoting other forms of institutional racism. A note from Kristina King, the National Medical Professional Action Committee and Integrative Medicine Coordinator for the American Medical Student Association (AMSA) arrived in late June: "The AMSA Board of Trustees has agreed to join Partners for Health with the Integrated Healthcare Policy Consortium (IHPC)." Asked for background on the decision, King ticked off IHPC's accomplishments and added in a note: "The American Medical Student Association, recognizing the importance of coordinating efforts to advance healthcare policy that is prevention-oriented, equitable and integrated, chooses to become a member of Partners for Health. There is no question that AMSA will be an important member of Partners for Health - bringing to IHPC's deliberations the day-to-day concerns of providing high quality integrated care. This is a synergistic partnership. As physicians work every day to deliver the best possible care to patients, IHPC is working to strengthen and undergird their efforts by advancing the bedrock changes needed to make integrated health care a functioning reality in the U.S. There is no doubt that together, IHPC and AMSA will accomplish great things." Comment: AMSA's open and affirming view of diversity is particularly warming as the AMA (see above) continues to favor discrimination. It's also terrific to see IHPC expanding its base in its Partners for Health program. The IHPC's partners range from organizations representing massage therapists and licensed acupuncturists to the MD-dominated and multidisciplinary American Academy of Pain Management and the MD/DO only American Institute for Homeopathy. AMSA joins the Naturopathic Medical Students Association as the second medical student organization to join IHPC. The June 2012 Integrator Round-up noted that the former director of the Partnership for Prevention, Jud Richland, has chosen to take a position as CEO of the American Association for Naturopathic Physicians (AANP). In an interview in the Natural Medicine Journal, the official journal of the AANP, Richlands's first words are: "The most important reason I sought this role is that I share the same values about health and wellness as naturopathic physicians. I believe that empowering people to take control of their own health is the foundation for living a happy, energetic, and fulfilling life. Our current health system, however, is not geared toward empowering people; it’s not geared toward treating the whole person or addressing root causes of illness. Therefore, we need to reorient the health system, and I wouldn’t have accepted this job if I didn’t think AANP was well positioned to help do so. Although the task is challenging, naturopathic physicians are agents for change, and I’ll do everything I can to help them become even more effective." Richland ticks off his top 3 goals, pre-articulated by the AANP board: make sure every individual has access to a naturopathic physician if he or she so desires; ensure every naturopathic physician has the opportunity to be successful; and third, accelerate the pace at which healthcare institutions and the healthcare system at large evolve toward an emphasis on wellness and prevention. Comment: I cannot think of a better bio for a CEO of the national professional organization for the naturopathic doctors than Richland. Here's a postulate on AANP's priorities as laid out by Richland: by focusing the AANP heavily on truly providing outspoken leadership on #3, it will draw to it the energy that will help it fulfill on #1 and #2. This is a community organizing strategy. Relatively poor organizations can't buy visibility and influence and so need to create it through their actions. Richland would seemed to be beautifully position in a network of national leaders in prevention for such a strategy. What we need are thorough models of whole-person, clinical prevention and health promotion that are linked to respect for community methods that need to be engaged at address the determinants of health. The NDs are position to do this. Here's hoping the best for Richland's ability to empower the enthusiasm he has already found in the ND community. Jim Winterstein, DC, the most outspoken advocate of chiropractic medicine (vs 'chiropractic') and chiropractic physicians (vs. chiropractors or chiropractic doctors) and of chiropractors as part of the solution to the nation's need for primary care, has announced that he will retire in June 2013 after 27 years as president of National University of Health Sciences. A proponent of an integrative healthcare system that relies more heavily on various forms of natural healthcare, Winterstein re-shaped the National College of Chiropractic to a university structure with programs in acupuncture and Oriental medicine, massage and naturopathic medicine, and a strong research department. His successor will be Joseph Stiefels, MS, DC, EdD (Cand.) who currently heads up NUHS' Florida campus. Winterstein, who turns 70 shortly before the transition, had told the board he thought he should resign, will continue involved with NUHS as president emeritus. Comment: Winterstein is one of natural healthcare's warriors. He has also been an Integrator subject and contributor: from an article about the transformation of NUHS under his guidance to numerous comments in Reader Forums over the years. (Search Winterstein on the site.) I personally honor Winterstein for his multidisciplinary vision and his decisions to involve his institution financially, and via the volunteerism of key personnel, in the Academic Consortium for Complementary and Alternative Health Care. Anyone who knows Jim will be likely to guess that, as emeritus, his presence will continue to be felt. The television segment that aired on Grey's Anatomy was called Let the Bad Times Roll. The story, which turned on a cancer, includes a moment when the character Arizona's friend states that his cancer was unsuccessfully treated by a "naturopath." As a result, the friend called a "real doctor." Later in the show there was a second reference. After the patient's surgery, Arizona confronts the patient and exclaims that the friend should not have gone to some "naturopath in Tibet" who was a quack. Comment: What added even more insult to the injury of these references to the Grey's Anatomy audience is purportedly based in Seattle, Washington. There, NDs are: part of the primary care matrix; have broad prescribing rights; are invested in many research initiatives with the the likes of the quackery-coddling University of Washington medical center, Group Health Research Institute, Seattle Cancer Care Alliance; are on staff at Virginia Mason Hospital (awarded as the top hospital of the decade); are regularly receiving referrals for cancer patients from Swedish Hospital via a decade-old relationship; represented on the state's office of Technology Assessment review committee and etc. More to the point, the Washington state licensing law for NDs requires that they work with oncologists on any cancer case. Oh well, polarization makes for a better story. Or does it? Integrative center publicist and consultant Glenn Sabin of Fon Therapeutics has a new post entitled Social Medicine: Opportunity or Risk for Growing Integrative Medicine Practices? Sabin, an Integrator adviser, begins with a do-no harm section which warns clinicians about what to avoid in the way of legal exposure. He shows himself an advocate, noting that best use of social media can help a clinic "engage, listen and grow." Sabin notes that the action steps are with the former. The latter follows from that pattern: "Social media is for engagement and storytelling." How to get going: "The secret is to start with an easily executable strategy and smart tactical plan in place." Mimi Guarneri, MD, the founder of the Scripps Center for Integrative Medicine, received the 2012 Linus Pauling Functional Medicine Lifetime Achievement Award at the annual conference of the Institute for Functional Medicine. The award, established by the institute in 1996, was created to recognize a clinician or researcher who has made a significant contribution to the development of functional medicine. Guarneri, the author of "The Heart Speaks," is president of the American Board of Integrative and Holistic Medicine. She was awarded a $100,000 prize last fall by the Bravewell Collaborative for her leadership in integrative medicine. The Scripps release is here. Comment: Guarneri, who is also leading the effort noted this Round-up to create a more formal specialty in integrative medicine, is an outspoken supporter of the new Bastyr University naturopathic medical program in her San Diego back yard. I like the co-existence of those two advocacy roles in Guarneri. Michael Murray, ND, has been awarded the President's Award from the Natural Products Association. A media release on Murray's contributions notes that he "has been instrumental in introducing many natural products to North America including Ginko Biloba extract, Glucosaine Sulfate, Quercetin, Curcumin, Saw Palmetto extract, St. John's Wart extract, Pharma GABA and PGX." Murray, a prolific author who is now a principal with Natural Factors, played a huge role in disseminating information about standardized extracts in the U.S. market.